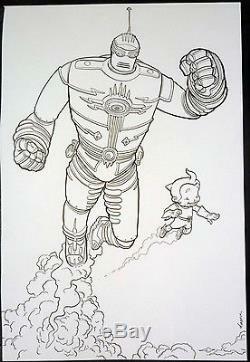 This original art is a specialty piece drawn by Geoff Darrow of the Robot characters Rusty and The Big Guy. It's drawn on strathmore type board, and has an art area of about 11" x 18". It's in very nice, clean shape. WE HAVE LOTS MORE ART ON OUR WEB SITE. The item "GREAT FLYING ROBOTS BY GEOFF DARROW RUSTY + THE BIG GUY" is in sale since Sunday, November 10, 2013. This item is in the category "Collectibles\Comics\Original Comic Art\Drawings, Sketches". The seller is "kirbyfan44" and is located in Simi Valley, California. This item can be shipped to United States, all countries in Europe, Canada, Australia, Japan.